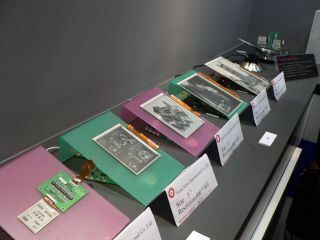 This week's Display 2009 show near Tokyo was home to more OLEDs, LCDs and plasma displays than you could shake a stick at, but pride of place undoubtedly went to a breakthrough in electronic paper from Bridgestone. The new QR-LPD e-paper display the company had on show not only revels in full-colour goodness, but is also the first to support user input from a pen or stylus. Bridgestone's previous e-paper sheets have taken up to 15 seconds to refresh, which was fine for the electronic newspaper the company demonstrated last year, but the new device slashes that to under one second. The speed bump means the display can keep up with input from a pen being dragged across its surface. That enables doodling, note making, annotations and more. There's no word on a commercial launch yet, but this is clearly the kind of display that we'll need if e-books are to grow into more rounded general-purpose devices to rival laptop PCs.